#breezegames to provide summer fun in west Leeds | West Leeds Dispatch | News. Views. Get involved! Bulldogs … chaaaaaarge! Young people across west Leeds are set for a summer of fun when #BreezeGames heads their way this summer. #BreezeGames offers challenges for children and young people to compete across a wide variety of low or no cost team and individual games and fun activities. 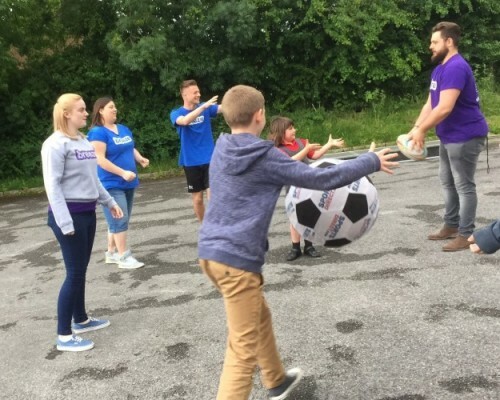 It includes traditional street games such as British Bulldog and old favourites with a modern twist like street football and demonstrations of popular games like rounders and kwik cricket. For the less sporty there are card games, board games, paper games, word games and cheap and cheerful craft activities that can be replicated at home. The programme will run in seven communities – Swinnow, Wortley, Farnley, Farsley, Calverley, Pudsey and Armley. At the Ley Lane session in Armley children and young people will be able to take part in additional fitness challenges as they learn how to use the area’s new outdoor gym equipment safely. They can also win free tickets for summer holiday activities being run at Armley Leisure Centre. All of the programmes will lead up to the start of the Breeze on Tour summer programme with Mini Breeze events being run in Farsley, Farnley and Swinnow, and with the main Breeze on Tour event returning to Armley Park. This article is an edited version of a press release issued by Leeds City Council. You can find the full release here.